Special notes :only offer NEC PRO software for users,did not including others. 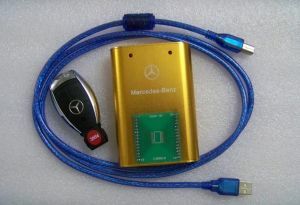 The new Mercedes device working with smart key (old and new) using in car since 1997 up to 2005 - without keylessgo system. You can program new key (ore used) in car and program oun key if its not work more. You read and program eeprom of CPU from Steering blocking module via diagnostic connector. Desolder and read via programmer two CPU from Electronic Ignition Control Module. Load theese eeproms to program. Desolder NEC CPU from the key. Soldering it on the device , select the No of key and program it. READ all CPU or key chips on their places and start the car. You can program new keys without the car - only with EIS and steering blocking module.